Something strange happens quickly into About a Boy. The viewer realizes that this movie is actually enjoyable. Not only on a small level, but this movie is fun to watch and emotionally touching. This is especially remarkable given the transparency of the plot. For movies like this, it is inevitable what will happen. Story originality is never a strong point. It is not the destination, but always the journey that makes a something like this fun and refreshing. What is different here is a series of sarcastic voiceovers by Hugh Grant, skewering anything and everything in his path. About a Boy is based on the novel by Nick Hornby, whose other books, High Fidelity and Fever Pitch, were also made into films, so it has a good pedigree. It was adapted by Peter Hedges (A Map of the World, What's Eating Gilbert Grape) with, oddly enough, the help of Chris and Paul Weitz (Down to Earth, American Pie). Perhaps it's the lowbrow influence of the Weitz brothers that also makes About A Boy different and more substantial than it otherwise would be. 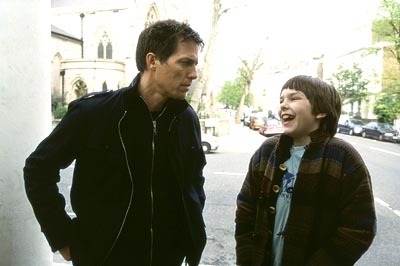 The title refers to two people, Will Freeman (Grant, Bridget Jones's Diary, Small Time Crooks) and Marcus (Nicholas Hoult, The Fallen Curtain, Intimate Relations). Will is a lazy, self-centered man who spends all day doing nothing. He is living off royalties from a song his father wrote, so he has no need to think about anything. He keeps himself occupied doing meaningless things, and has never had a relationship longer than two months. Marcus is the kid in every school who dresses weird and has no friends. His mother Fiona (Toni Collette, Changing Lanes, Shaft) is a neo-hippie and is battling serious problems with depression. They live in two completely different worlds, but meet when Will is experimenting with dating single mothers. Marcus and Fiona are friends with one of the women Will meets, and soon Marcus begins hanging out with Will because he doesn't want to be around his mother. Will eventually relents and lets Marcus hang around, most likely because he is too lazy to do anything else. In fact, he even uses Marcus to attract Rachel (Rachel Weisz, The Mummy Returns, Enemy at the Gates), an attractive single mother Will meets. So while Marcus is physically a boy, Will is one mentally. He refuses to grow up, take responsibility, and care for anybody aside from himself. Needless to say, spending time with each other begins to change both of them, Will in particular. Marcus is the first person that Will can care for altruistically. It's a strange new feeling for him. About a Boy seems like romantic comedy fodder, but surprisingly (and wisely), the Weitz's downplay the Rachel character, choosing to focus on Will and Marcus. Everybody can watch as Will slowly begins to realize that there is something more to life than himself and his toys. Like the Will character, the script sometimes delves into topics that are not as superficial as they seem. Fiona is dealing with some serious problems, and Will is clearly uncomfortable at the thought of trying to help. Will's change is believable because it occurs in small steps. The Weitz's take their time with his character, realizing that Will is extremely scared at the possibility of any sort of responsibility. Grant has an easy time playing Will, because the role is so similar to many of his other roles. It is a strange combination of slimy and earnestness that matches Grant's strengths in acting. With a shrug of his shoulders, roll of his eyes or his trademark blinking, he can quickly convey how little Will cares about the world. Grant does lose his usual stuttering, which also helps bring Will across as a jerk. His narrative commentary is priceless. It's as if he recognizes he is in a movie, and says all the things that the audience is thinking when watching. So instead of the audience mocking the characters and situations, one of the characters is doing it for them. Collette is as good as she always is, disappearing into her roles, and Hoult does a nice job too, as does Badly Drawn Boy (aka Damon Gough) who provides the music. By the end of About a Boy, everything wraps up nicely as movies like this always do, but the difference here is that it feels good, not forced. Haro Rates It: Pretty Good. 1 hour, 45 minutes, Rated PG-13 for brief strong language and some thematic elements.